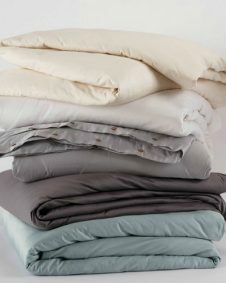 Organic Comforters [100% Certified] Wool-Filled for Your BEST Sleep! When you get into bed at night after a long day or lie awake in the morning enjoying the soft light, you want to feel warm and protected under your bedspread. But how can you when you learn about the many toxic chemicals like formaldehyde and fire retardants that are commonly found in synthetic pillows, down comforters, duvets, mattress protectors and mattresses? Ditch your chemical cocoon and instead embrace our pure, all-natural organic wool-filled comforter. Not only are they 100% safe for your body; they’re better for the planet, too! Made for all-season comfort, our 100% Certified Organic Wool-Filled Comforter is handcrafted using several pounds of organic wool batting encased in organic cotton and machine tufted to hold everything in place. Shepherd’s Dream comforters are available in any size you need: baby, throw, single/twin, double/queen and king. Down vs. Wool: Which Bedding Comforter is Best? Organic comforters and bedspreads are typically available in one of two materials: down and wool. Both products are popular bedding materials because they are sustainable, renewable, and organic. But which is better — the goose or the sheep? Both down and wool are safer, healthier, and far more effective than synthetic comforters. But down doesn’t have the same moisture wicking properties of wool and can’t handle being wet for too long before developing mold spores and dust mites. Excess moisture has also been shown to virtually eliminate down’s thermal properties, making it less durable. Wool, on the other hand, has unique temperature regulating properties that naturally wick away excess moisture and oil. Scientists have discovered that as we we sleep, many humans perspire or sweat up to a pint of moisture during the night. It’s completely normal and healthy, and happens regardless of gender, age, body size, or health. Once this perspiration leaves your body as you sleep, it has to go somewhere. In the case of down comforters, the moisture gets trapped against your skin – which can leave you feeling hot and sweaty, cold and clammy, not to mention smelly. Moisture can also seep into the material, saturating the down and making the comforter less effective. Unlike down, our wool-filled comforters will not overheat and never feels clammy. Wool is pleasantly lightweight, yet slightly heavier than down. Encased in soft organic cotton and machine tufted throughout to hold the wool in place, we offer the best all-natural comforter made from the purest materials. Ultimately, deciding which one is best for you comes down to personal preference. However, we’ve found that wool is the clear winner for most people — starting with our happy customers. Our Organic Wool-Filled Comforter is 100% all natural and synthetic free. The entire process is done by hand and without any chemical additives whatsoever. Wool is a natural, renewable fiber that offers consumers an affordable green choice. Wool is also biodegradable, making it an eco-friendly product. Wool fibers will not support combustion. Rather than melting or sticking to the skin as most artificial fibers do when aflame, wool simply smolders or chars. Additionally, wool normally self-extinguishes when the flame source is removed. Wool fibers draw moisture away from the skin better than cotton or down, helping your body naturally regulate its temperatures in all seasons. Keeping your organic comforter clean is a breeze. Simply sun and air seasonally to naturally bleach out stains and to revitalize the wool. Read more product care tips here. Wool has a natural ability to help regulate your temperature by helping to keep you warm in the winter and cool in the summer. This benefit allows many people to sleep soundly through the night. At Shepherd’s Dream, our philosophy is much different from other bedding companies in that all of our products are 100% chemical-free, pure lambswool and American made. We stand committed to using the highest quality materials and engaging in environmentally-responsible, sustainable production techniques and industry practices. Our organic comforters and bedspreads aren’t the only way we help enhance your sleeping experience. We also sell wool mattress toppers, mattress pads, merino wool blankets, wool pillows and organic cotton sheets to help you sleep your natural best! Not ready to buy yet? We’d like to offer you a Wool Bed Sample Bedding Kit. Try out our comforter as well as our wool mattress, mattress topper, mattress protector, wool felts and latex slats. If you don’t live near one of our best testing locations, then this is the perfect chance to try out the wonders of wool first hand. We charge a nominal fee of $50-60 to cover shipping costs to and from your home. If you decide to purchase wool bedding items totaling more than $500, we will subtract this amount from the merchandise total of your order. Fill out the contact form or call our office to request your sample kit today at 1-877-960-1323.